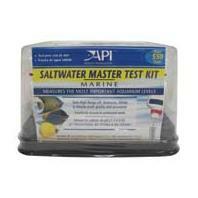 • A complete kit for testing marine aquarium water. • Tests water four ways to protect marine fish and invertebrates from dangerous water conditions. Complete test kit to test marine water. Includes tests for high range ph, ammonia, nitrite, and nitrate. Also features computer analyzed laminated color cards, instructoin booklet, four test tubes, holding tray for test solutions, and test tube rack. Aquarium Pharmaceuticals - Saltwater Master Test Kit product is categorised under Wholesale Aquarium Pharmaceuticals Inc products, Wholesale Aquarium Products, Wholesale Test Kits.